Since toying with my third XA2 recently, I’ve been hankering after a Sony model higher up the range, but have been put off by the logical route, by this XZ2 being £700. In 2018 with the likes of the Nokia 7 Plus, Moto G6 Plus, Honor 10 and many others offering so much for so much less, it seemed like madness to consider. However, a temporary sale price of £499 at CPW in the UK had me snagged. Those who have followed my ramblings will know that over the years I have loved Sony stuff. I love the name, the style, the design, the attention to detail - and this across most devices, not just phones. There has also been a love/hate thing with Sony phones, though. I don’t like the way that they have pushed the user into their marketing, in-device and pre-installed apps and services, some of which can’t be disabled and/or uninstalled. So I usually get wow’d by the Sony hardware, get one in, then return or sell it because I’m so disappointed by the UX. I wonder if this was destined to head for the same graveyard. What it has got going for it, first and foremost, as far as I’m concerned, is style and design. I bang’d on about the Nokia 8 Sirocco for a while being similarly lovely to hold and a delight to own - without the need for it to actually use it! The XZ2 is reassuringly heavy in the hand at nearly 200g and unfashionably fat - a bit like me! I like that! At 11.1mm it’s over twice as fat as my Moto Z! I really like the size of the Nokia 8, which is a reason why I keep going back to it, and this is a similar height and width to that. Slightly smaller, but certainly less thin! It’s certainly far less tall than the Nokia 7 Plus and not as wide. There’s a class of device emerging on size that is just right in the hand for usability but just big enough to comfortably see and pocket. Over and above all this technical sizing stuff though, is the style and design, as I was saying earlier. It feels like a million dollars in the hand, the smooth curved glass on the back and front disappear under the aluminium ring around the device. It feels classy and, dare I say, worth, even, the ‘proper’ price! Yes, OK - we all bang on about the pitching of devices that do 90% of the stuff of flagships for less than half the price, but when you get a nicely designed flagship in your hands, the argument slips away! Sometimes, as I said about the Sirocco, it’s just lovely to own something which gives so much pleasure, regardless. Note that you won’t get away with using this with no case! It rocks on surfaces because of that curve - and you will break the glass on the back! The other attraction for me was the stereo speakers which reviewers around the circuit had said were very good indeed, if not Razer/Marshall standard. I needed to hear them for myself. I’ve been testing the forward-facing stereo speakers, obviously against the Razer, and it really does very well. The stereo separation has been done well, but I don’t really get the point on that with a pocket-sized device. I was trying to watch a Netflix video with the phone in front of my face and in order to get the smart stereo surround sound, blah, blah, I have to get the screen closer to my face than my eyes will let me focus. What do I do, get a huge magnifying glass! Maybe younger people will do better, but for me, it’s about the overall sound output when held or placed a couple of feet in front of me. The sound is actually very good. It’s pretty loud when left untweaked by the plethora of tools which Sony supply. It’s not in the same league as the Razer - and in order to beef out the low-end, as usual with phones, compromises need to be made on volume. But it’s much better than most anything else out there (that I have personally heard) and more than adequate for casual listening, certainly of voice, in a relatively noisy environment or filling a bedroom with music. Could be better, but it ain’t bad. I’ve been using it now for a couple of days and I’ve not been annoyed at not being able to get it loud enough nor winced at a horrible tinny high-end. Whist exploring the sound output from the phone, you’ll discover one of the unique features of the XZ2, that being Dynamic Vibration. It’s a bit of a gimmick really, as it vibrates at three adjustable levels of intensity along with the peaks of output from any sound or video being played. It starts off as a bit of a fun novelty, but actually after a while I realised that I didn’t want it to be off! It continues to work even when pushing out sound elsewhere via bluetooth (which is a bit odd) and with headphones too. When watching a film, again it seems a bit odd to start with but over time it becomes quite natural. I’ve ended up liking it being on, though I wonder what it’s doing to the battery and/or structure of the internals vibrating so much! There’s no 3.5mm audio-out, incidentally, but I won’t go on about that again. You know how I feel! There is a USB-C to 3.5mm adapter in the box. There’s also a revolting-looking in-ear set of earphones - which, incidentally, have a 3.5mm plug on the end! What?! Either go with USB-C or don’t! There was a promise of a EC270 USB-C/3.5mm/Charging adapter from Sony in European sales, but there isn’t one here. And there’s a suspiciously big box in the packaging with just a couple of leaflets inside. They obviously changed their minds! I’ve ordered one, so will report back. Fortunately, I hardly ever use ear or headphones, so personally, I don’t care! I understand that you might though and I can report that testing the setup with my AKG headphones, the 24-bit audio output works well, except there’s no control of the audio settings. You get basic shaped output as they have, presumably, decided on a generic default - much like Honor/Huawei have done with Histen. Still, it sounds great to me! It seems like Sony have done something to their 24-bit dongle, output, digital/analogue etc. which means that they are heavily encouraging people to buy their accessories. Everything works perfectly with bluetooth, incidentally, with all the devices I’ve tried, with all the latest supported features and technologies, as far as I can tell. We have an analysis and conversation going on between the Community members at https://goo.gl/CJHGpU if you want to see and understand more. The Snapdragon 845, IP65, IP68, Qi Charging and 6GB RAM certainly qualify the Sony Xperia XZ2 as a flagship. The in-vogue (and first for Sony) 18:9 ratio 1080p IPS LCD Triluminos 5.7” GG5 display and X-Reality Engine adds to that ticket along with the aluminium frame and glass all round. Android 8.0 is present with July 2018 Google Security Update, just in time for Android 9 to outdate it! Sony have a fair record, better than most, of updating firmware in a good timescale. We’ll see! This is Sony’s first shot at an 18:9 screen and thankfully they’ve not notched it, nor have they ‘rounded’ the corners. It’s a clinical rectangle, the way a screen should be! The bezels left and right are small, but not stupidly so. The chin and forehead have been reduced, though still leaving space for the two speakers, making the device just right in the hand, as I said earlier. The screen is an LCD but what I found, similarly to the XA2, is that it’s as near-gorgeous as AMOLED. Sony seem to sprinkle some magic dust to make this happen via their Triluminos technology. The blacks are deep and colours rich. For those who wish to saturate their experience the colour profile can be changed from Professional Mode (as you see it), Standard Mode (like most people expect in a phone) or Super-vivid Mode (with glorious technicolour)! Out in sunlight, with auto-brightness cranking it right up, the screen is certainly usable though not in the class of the Nokia 8. One of things that no reviewer can get past it seems, is the fingerprint scanner being (almost) in the middle of the back of this phone. Firstly, hurrah for Sony sticking with the back and not returning (yet) to the side. Secondly, in just two days with this device my brain has totally got used to the lower position of the sensor after, admittedly, keep touching the camera lens. I have no idea why they took the decision to put it there (maybe with thoughts of landscape use) but it’s OK - like most design variations, people get used to them if they have to use them. Thirdly, it works as fast as lightning here with the slightest touch, the setup is quick and accurate and it’s nicely sized as a circle. Above the scanner is the camera cluster and down the bottom, the subtly etched word XPERIA. On the base is a USB-C socket, around the perimeter is various microphone holes and antenna breaks with a SIM Card Tray at the top (in my case Single SIM and microSD Card) which, in the usual Sony way, reboots the phone when pulled out. On the right side is the volume-rocker high up, power button in the middle and shutter-button low down (hurrah)! I was trying to work out why anyone would need the option in settings to double-press the power button to launch the camera, when the shutter button does this. Bizarre! Sensors and camera in the forehead of course, along with the top earpiece providing half of the stereo and a very slim slot right at the base of the chin pushing the other. All buttons are metal, good quality, firm and solid in use - classy as you’d expect for a phone in this class. I was very dubious about the 3180mAh battery and held off for quite some time, even at this sale price, because of that alone! Reviewers around the circuit reported that the battery performance was disproportionately strong and along with the fact that the device has QC3 and Qi charging, this pushed me over the edge. I can now report that they were right! I don’t know if it’s more Sony magic dust or the kudos belongs to Qualcomm for the SD845, but yes - amazing performance for the size. Tested over two days and mixed use (quite heavy while reviewing) and we’re looking at 24-30 hours between charges with a staggering 8 hours of SoT during that time and auto-brightness. How do they do that! So for me, no fears! 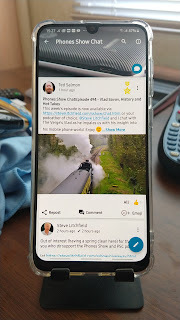 The usual experience with Sony phones these days is that there’s much less third party bloat than there used to be, a goodly sized helping of their own apps and services, some of which can be uninstalled, some disabled - and some the user just has to ignore! This situation is better than it’s ever been, but it still needs to be sorted out. As far as I’m concerned, the only useful additions in terms of apps are Music and Video. Unlike Vanilla, using these two apps makes it clear and clean for files held in memory on the device and gives a good quality Walkman-style experience for media consumption. Paired up with good bluetooth headphones or using the phone’s speakers, the experience is top notch and stuff is one place, where it should be, not littered around in Photos or Music apps elsewhere, Google! The rest of it, though forms the following list - deep breath... 3D Creator, Album, AR Effect, AVG Protection, Bokeh, Camera, Clock, Contacts, Email, Facebook, Facebook App Manager, Files, Kobo Books, Lounge, Movie Creator, News Suite, Amazon Prime Photos, PlayStation, Sketch, Style Cover, SwiftKey, Themes, Video & TV SideView, Weather, Xperia Assist, Xperia Home and Xperia Transfer Mobile. Now apart from the camera, which I’ll come to, all of that is bolt-on stuff that is not needed and mostly serves Sony to lock users into themselves and their partners' services. Excusable from Honor, to keep down the cost of a handset, but from Sony - charging £700? Come on! Anyway, with careful use of launchers and App Trays, the user can, if they know what to do, get it all out of sight. The default launcher is as Vanilla as Sony ever got! Layout is good, options in (Launcher) Settings to show the Google Feed to the left or not, some fancy stuff like hiding the App Tray button enabling up-swipe to get there, down-swipe for a Sony device search for text strings in Contacts and Messaging (and suggested Apps, which is the annoying bit here, but can be turned off! ), icon size and layout of grid options, how the page transitions go, access to their Theme Store for changing look/feel with some free but many paid-for and wallpapers etc. The drop-down Notifications and Shortcuts area is very Vanilla, which is good, and can be adjusted in the usual way. I was resisting putting Nova on for now, and actually, now that I have things sorted and tweaked, don’t really feel the need to do so. 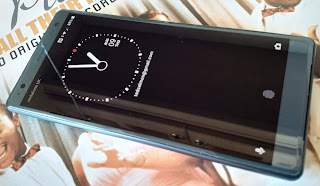 The phone is incredibly fast around the UI, as you might expect with this hardware, touch anything and it leaps into action, no sniff of any delay anywhere, hopping between open apps and starting unopened ones. I can't find any glitchy behaviour with this Single SIM version (I know that +Gavin Fabiani-Laymond gave up on the device, reporting many bugs, but he did have the Dual SIM version imported, and I wonder if that’s made a difference). It’s a shame that Sony have still not really yet implemented an Always On/Glance screen in a meaningful way, nor DTTW. Lifting the device fires up the screen with an option then to DTTW, but then security is needed to get in of course. Pressing the power button on the side gives the same outcome - a quick glance of the clock (of which there are plenty of interesting choices) with the option to then go past security if you want to look at something Notified thereon. I have found myself using a variation of these options, and love the analogue clock! I think that all devices with a fingerprint scanner on the back should allow DTTW for those times that it’s on the table, making use of the speakers, for example. A missed opportunity. I’ve been a great ambassador for 128GB as a standard for SmartPhones in recent times, and I stand by that, but by insisting on it, one crops out a whole bunch of options and devices. I have to admit that it’s been a long time since I’ve had quirky behaviour from a microSD Card and sure enough, as long as devices are turned off between switching, maybe those days are behind us. Sony was one of the worst offenders a couple or three years ago, along with Moto - but I have been switching here without incident. Fingers crossed. Armed with a 400GB microSD Card, with all transportable data on it, it works well - and I currently have about half of the 64GB used. Delve into Settings and there’s all sorts of Sony stuff alongside the usual customers, including PlayStation hooks, STAMINA battery controls (which really don’t seem needed), Xperia Assist (with all sorts of options and settings for automated Actions, memory cleaning, battery optimising, gaming, night light mode allowing the user to set all sorts of useful switches). There’s even a new Chat feature, which allows the user to enter a Messaging-style dialogue with the Help section in device. There’s loads of stuff to explore and make use of without it feeling like it’s bloat or forced on the user. The main camera is a 19MP (at 4:3) f2 (24mm in full-frame terms) unit with a Sony sensor which, according to some, underperforms like the rest of the Sony phones’ cameras and sensors, including the 5MP f2.2 front-facing camera. There’s no OIS anywhere and the party trick for the camera is to be able to shoot 4K HDR Movies and slow motion in full HD too, apparently a first and one-over on Samsung! Woopy doo!(?) 960fps for 0.1 of a second - make sure your timing is good! They got into bed with Facebook (for easy posting - figures, I guess!) with the 3D Creator mentioned earlier, which allows the user to make a 3D virtual model of someone’s face. Very useful! About as useful as the AR childish effects putting dinosaurs on your carpet. It just seems to be aimed at Japanese Pop Culture, which for Sony I guess is a fair target market. The Bokeh Mode seems to work as well as any out there, with a live slider, but I still get the best performance adjusting things manually, personally. There are reviewers who do this for a living who are saying that actually this is Sony’s best shot at a camera ever and it performs very well. So mixed opinion. The shots that I’ve taken with it all seem perfectly good, even in low light, but then you probably know my approach by now. It’s a tiny sensor in a tiny device and if you want anything more than snaps for social media, get a camera with a proper sensor. The camera app is stuffed full of the usual plethora of options, bells and whistles, with apps downloadable and able to plug-in to the camera’s menu system ready for use. It’s a tinkerer’s delight with Manual Mode on-screen sliders and controls and SteadyShot here and there, but I keep going back to the Superior Auto Mode. It seems to get stuff just right almost all of the time, intelligently selects all settings for the user and gives most people what they want, most of the time. I think the camera is just fine for me. Some express boredom declaring ‘more of the same’ whilst others think things are looking up. I would never have paid £700 for this phone, but at £500 it feels like it’s good value, beautifully made, very capable, interesting and different with a class, style and design that Sony seem to be good at and have been for years, in my book. Not sure how long that price will be maintained, but if it goes, I see AmazonUK are also pitching £629 after flirting with £499 for a week or so. It’s officially available in Liquid Black, Liquid Silver, Ash Pink and like this one, Petroleum Blue. I recommend it very much. It feels and performs like a quality premium device. Will it get priority over other options here for holding my SIM Card? Well, yes - I like it a lot - for now!